My wife and I enjoy riding to the North Georgia mountains and occasionally going to motorcycle rallies. In fact, one of the rallies that we frequently attend is located in Milledgeville, Georgia. As an attorney, I have represented many clients involved in motorcycle accidents. Many such accidents occurred when the motorcyclist encountered a negligent automobile driver, which is unfortunate. Our Full Throttle Ride started at 3:00 am. We went from Tallahassee Florida to Jacksonville on I-10, to Miami Florida across to Alligator Alley, and back through Tampa Florida. Our last fuel stop for the ride was in Lake City Florida. By 10:30 that night and over 1000 miles later the four of us were back in Tallahassee. I feel truly honored to be a member of the Long Distance Riders. I am the 22nd member of LDR and to memorialize that honor, my motorcycle license plate is numbered LDR 22! 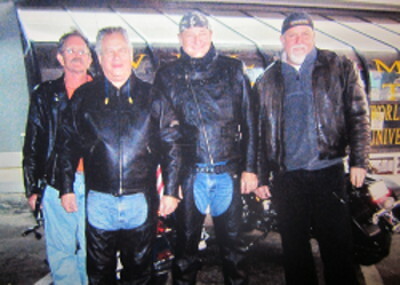 The photo enclosed features from left to right, Jerry Leming, Don Hyman, Mike Scott and Jack Powis.